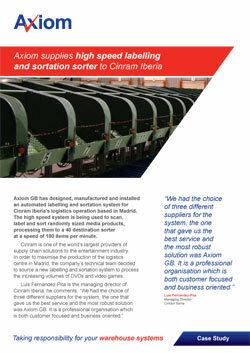 Cinram is one of the world’s largest providers of supply chain solutions to the entertainment industry. In order to maximise the production of the logistics centre in Madrid, the company’s technical team decided to source a new labelling and sortation system to process the increasing volumes of DVDs and video games. “We had the choice of three different suppliers for the system, but the one that gave us the best service and the most robust solution was Axiom GB. It is a professional organisation which is both customer focused and business oriented. “Using the Axiom sortation and labelling system we can now work more profitably; doing this type of work manually would be entirely unprofitable. We started using the system for just 20% of our orders and this has increased to 60%. In addition, it is now used for our reverse logistics service.